What are the driving factors which can compel movie fans to go for a movie? There are many aspects which are directly linked with the grand success of a movie which include the star cast, director and pre publicity. Even though movies made in malayalam with huge budget fail in the box office, it is refreshing to know the positive verdict of those films which are produced under an average budget. After a movie wins the heart of the viewers, it should be the producer, who should really need a round of applause for putting 100% conviction on his director. 'Lucky Star', the movie which reached theatres on 8th March was truly a challenge in the career of Deepu Anthikkad who helmed the project. Being his directorial debut, Deepu did had the guts to take upon 'Lucky Star' on his shoulders which had truly proved to gain support from family audience who wish to spend a couple of hours for a pleasure trip. Milan Jaleel, known for producing a number of successful movies was brightened by the strong willpower shown by Deepu when both came together on the discussion table with actor Jayaram creating space for the meeting. Milan sensed elements of passion and overwhelming interest for movies in the eyes of Deepu who had already shown his mettle behind the camera directing ads for popular brand houses. Lucky Star which was released in 73 Theaters across Kerala and 23 theaters in Tamil Nadu and Karnataka has made an upbeat flight with 'House Full' boards shows up in few theatres for the morning show. 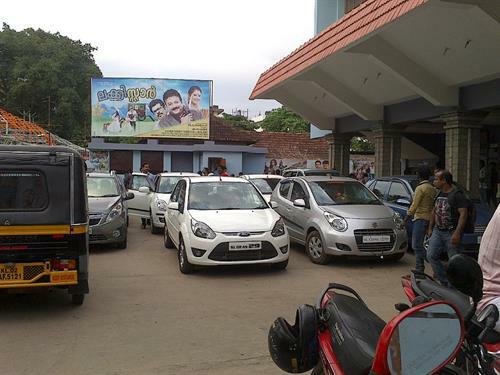 The pre –publicity of the movie was a key factor along with star pair of Jayaram and Rachana Narayankutty which dragged movie enthusiasts to the theatres. The story of the movie revolves around the life of a Ranjith( Jayaram), a tailor by profession who aspires to become a billionaire. Being an over ambitious person, Ranjith wants to achieve his dreams either by becoming an actor or winning a lottery. During his life journey, Ranjith meets a junior artist Janaki (Rachana) who later become his soul mate. Life was not comfortable for the couple when their financial situation was not well to bring their dream alive. Taking a decision to make money by any cause, Ranjith and Janaki meet infertility specialist Dr Joseph Chittilappally (Mukesh) to go for womb rental (surrogacy). "Lucky Star' travels through the second phase when some unexpected events creep into their life. Lucky Star stays out of those 'heartless movies' released in the past with its uniqueness wrapped up in strawberry flavour. Visually the movie is truly an entertainer which can enthrall the family audience who could spare their time to get refreshed. The soul of 'Lucky Star' will be the script swathed with all essence of humour, emotions and thrills making it a clean entertainer. Deepu had proved his mettle as a director bringing life to his own script on to the screen. The novel treatment of the movie makes it stand ahead in terms of its deliverance and execution at the right moment. Deepu Anthikkad, the writer-director is truly a man with perfection who has really sown seeds for his long run in the film industry. With its witty and funny dialogues, 'Lucky Star' is not too meant for the young (new generation movie viewers), but truly for the family audience who wish to enjoy a movie without closing their eyes and ears. Ratheesh Vega has again proved his skill with magical fingers giving a handful of melodious songs which soothe the ears. Jayaram gave his best appearance in the movie which has wooed the audience making them to keep their hands close to give rounds of claps. Rachana Narayankutty was the right cast for the character who really had done a terrific job with her charming on screen performance. Days are less to count on, as new projects will soon be jumping in front of Rachana, the small screen heroine now queen on silver screen. Vijay Ulaganath, the Cinematographer, who wielded the camera, had given pure dedication for each shot which had a realist touch. Being an associate for various tamil movie including Sivaji, Vijay is brilliant in zooming his camera. The child artist is another attraction who delights the audience with his majestic performance. Mukesh, Pooja, T G Ravi, Mamukkoya gave sincere contribution with their characters. Deepu himself gave an entry in the movie playing a small cameo role. Moving away for the worthless movies wrapped with unhealthy scenes and dialogues, being made to entertain the young generation, 'Lucky Star' would be special for the audience to keep their mind clean and fresh in and out the theatre. So 'Lucky Star' will be your cup of tea and a fantabulous visual treat for family audience. Another interesting cst is that 'Lucky Star' would get a bollywood version with Madhavan in lead.